MARIUPOL, Ukraine -- Scanning the sky for incoming artillery fire has become a force of habit for Ukrainian beetroot-seller Svetlana Kumurzhi, who dived under her wooden stall in government-held Mariupol when shells rained down a month ago. 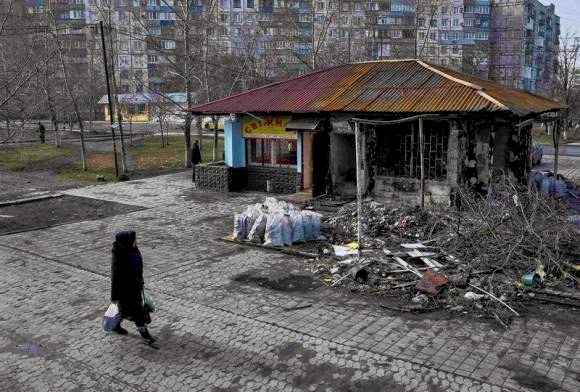 A woman walks past a burnt-out a store at a residential sector affected by shelling in Mariupol, a city on the Sea of Azov, eastern Ukraine. While a fragile two-week-old ceasefire shows signs of holding, Kiev says pro-Russian separatists are using the truce to regroup their forces, especially around Mariupol, a strategically important port city in Ukraine's southeast. Control of the industrial hub would help the rebels form a corridor to the Crimea peninsula which Russia annexed from Ukraine last year. Since the truce, they have said they aim to win the city through negotiation, not force of arms. Aware there is no provision for that in the latest internationally brokered peace accords, Mariupol's residents are holding their breath. "We're all afraid the fighting will come here again, we can't leave because there's nowhere to go. Look, nobody has money here," Kumurzhi said, gesturing at the crumbling Soviet apartment blocks around her. 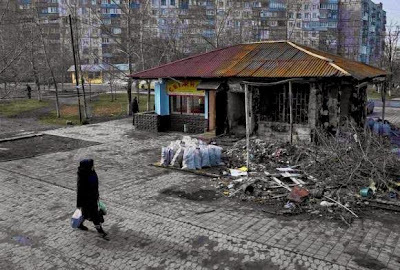 The shelling on Jan. 24 killed thirty people in the district of Vostochnaya where she runs her stall. Plastic sheeting has been taped over many of the windows, blown out by the blasts around the marketplace and a nearby carpark is filled with the burnt out shells of cars. Shrapnel marks scar the roads. Government troops and rebels have been vying for control of the nearby village of Shyrokyne, each accusing the other of provoking the other side to attack. The guns have fallen silent in recent days, but on Friday Ukraine's military said it had tracked a convoy of GRAD missile systems and other military equipment leaving the separatist stronghold of Donetsk in the direction of Mariupol. Kiev also says military equipment from Russia has been spotted crossing the border by Novoazovsk, east of Mariupol, since the start of the ceasefire, aimed at ending a conflict in which nearly 6,000 have been killed. The separatists, who seized Mariupol briefly as they swept through eastern Ukraine last year, say it should be theirs. "If Putin decides he wants Mariupol then they will take it, they're better armed than us," said national guard soldier Vitaly Mashtabei, stationed near Vostochnaya. "When we capture fighters from the other side, they have top-of-the-range modern guns and most of our guys only have the old Soviet stuff," he said. Kiev and its Western allies say the rebels are funded and armed by Moscow, and backed by Russian military units. Moscow denies aiding sympathisers in Ukraine. In the centre of Mariupol, only spray-painted signs to the nearest underground bomb-shelters suggest residents are living under the threat of attack. "We've heard no shelling for a few days, so that's some positive news at least," said Yuriy Zinchenko the general director of the sprawling Metinvest Ilyich steel works, which together with its sister factory, Azov Steel, employs nearly 10 percent of Mariupol's population. "If fighting breaks out in the city then nothing will be left of it," he said, his hands clasped in front of him. The plant is producing half as much steel as before the conflict, but has kept working despite rebel artillery strikes on the bridge connecting it to the port in December and severe supply disruptions, he said. Rebels initially disavowed the ceasefire deal to seize the transport hub of Debaltseve, which it had also claimed as its own, in a humiliating defeat for government troops that destroyed most of the town's strategic infrastructure. The example of Debaltseve was "terrifying," Zinchenko said. "But we're not going anywhere, we're planning to stay here and flourish." Asked about a possible offensive on Mariupol, Denis Pushilin, who represented the rebels at the talks which brokered the peace deal, said last week they would choose negotiation. "We'll do everything possible to make it happen through political means," Russian media quoted Pushilin as saying. Prime Minister Arseny Yatseniuk accused separatists of trying to destabilise Mariupol, where Russian and Ukrainian sympathisers live side by side, by disrupting supplies to its steel plants from the Avdiivka coke plant, around 100 km (70 miles) to the north. "They are intentionally bombing Avdiivka to destroy the coke plant, so that Mariupol's factories close, so there's a social revolt in Mariupol," he said in a televised interview on Friday. The Ukrainian military reported a significant decrease in rebel attacks over the weekend, but said GRAD rockets had been fired at Avdiivka and tanks had fired at government troops stationed there. In a dilapidated boarding house in Mariupol, refugees from across the conflict zone waited wearily to see if they would be forced to flee once again. Small boys played tag in the corridors as women lugged buckets of water up to the rooms, which have up to three families crammed in at a time. A child's drawing was taped to each door. Some depicted Ukrainian flags or doves, others showed tanks and smiling soldiers firing guns. The most recent influx of people came from nearby Shyrokyne. They had been living in bomb shelters for three weeks until escaping a week ago. Retired fish factory worker Vera Lohozinskaya waved her walking stick in the air as she described the fierce battle for her village. "There were tanks here and tanks there, everyone shooting at each other. And we were just sitting there, shaking underground. It was pure animal fear. God forbid the same thing happens here," she said.